Disable right front brake with the flip of a switch. Commonly found on dirt modified and late models, electric shut-off helps turn the car on entry when track conditions are heavy/wet. Kit electronically disables the right front brake yet allows brake pressure to bleed-off from the right front brake caliper unlike manual shut off valves. 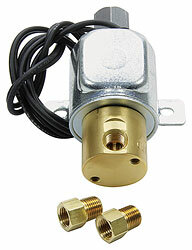 Includes brake lock solenoid, two male fittings, two 1/8"NPT plugs and detailed installation instructions.